The Ginkgo tree is Native to China and considered the oldest tree on earth. 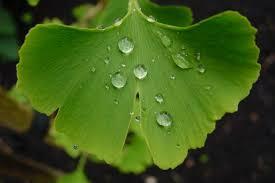 Ginkgo leaf is one of the best herbs for enhancing memory, vitality and circulation. It is also an antioxidant and is useful against free radicals, substances that damage cellular health and accelerate aging. It is one of the best herbs for the circulatory system, serving as a cardiac tonic by increasing the strength of the arterial walls. Ginkgo promotes blood flow and oxygenation throughout the body. As a tea for improving memory, combine with rosemary and sage. For a circulatory tea, combined with hawthorn and lemon balm. For stress and anxiety, combine with oats and nettle. Ginkgo is also well preserved as a tincture and can be combined with the same herbs for a tincture formula as listed above for teas. Cautions/Contraindications: Ginkgo may be contraindicated for people who have problems with heavy bleeding: during menstruation, when wounded or for several weeks before and after surgery.